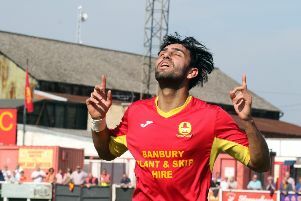 Banbury United boss Mike Ford says there is a real determination in the squad to bring success to Spencer Stadium. The Puritans host Mangotsfield United in Saturday’s Evo-Stik Southern League clash with Ford looking for his side to produce a big performance in front of their home fans. United are unbeaten in Division South & West since the opening day but too many draws have hampered their rise up the table. However, Ford feels his squad is now ready to make the next step following Saturday’s impressive display at Yate Town in the FA Trophy. He said: “It’s all about maintaining standards and we’ve got to take Saturday’s performance at Yate into the game with Mangotsfield. “We haven’t produced our best in games for long enough periods but we did that on Saturday. We were resilient in the first half and played some good stuff in the second half. “I told the players before the game that I wanted everything to be right. To be successful you need eight or nine players getting seven out of ten marks each week and we had that at Yate. United will travel to Hungerford Town in the next round of the FA Trophy but Ford will be looking for his side to climb the table before then.